Energy and Enterprise Initiative Executive Director and former Republican Congressman Bob Inglis expressed urgency to repeal and replace President Obama’s executive regulation of coal-fired power plants. EPA’s regulatory approach is a clear example of the bad policy Americans get when Congress fails to legislate, and conservatives allow liberals to control the whole climate discussion. Energy and Enterprise Initiative Executive Director Bob Inglis expressed urgency to repeal and replace President Obama’s executive regulation of coal-fired power plants. “We applaud EPA civil servants for their dedication to lowering climate risks. Unfortunately, these power-plant regulations are an expensive mirage, not a solution. If – and it’s a big if – EPA’s plan withstands years of litigation, then the best case scenario is less prosperity, more government, and perhaps fewer emissions, though some of those emissions will simply have followed our jobs to China and India. “But a free enterprise approach to climate issues would mean more growth, more prosperity, less government and a lot fewer emissions. There’s a reason why virtually the entire economics profession agrees that there’s a much better way than EPA: a simple, transparent, and 100% returnable tax on the environmental and health costs of emissions. “A returnable taxon emissions does three things EPA can’t do: 1) sets up a substantial income tax cut so that consumers have more money to innovate away from full-cost carbon fuels ; 2) shrinks the size, scope and power of the federal government by making it possible to repeal a mess of government subsidies and regulations that would be made redundant ; and 3) achieves global reductions in emissions by making it advantageous for our trading partners to join us in pricing carbon via a border-adjustable price on emissions. 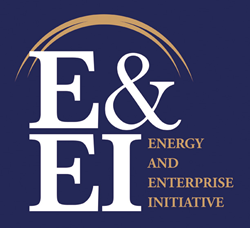 The Energy and Enterprise Initiative is a nationwide public engagement campaign promoting free-enterprise solutions to energy and climate challenges. Based at George Mason University, E&EI works to build support for energy policies that are true to conservative principles of limited government, accountability, reasonable risk-avoidance, and free enterprise. Former South Carolina Republican Congressman Bob Inglis (1993-1999, 2005-2011) serves as executive director of E&EI. For more information, visit http://www.energyandenterprise.com.